A cruise ship's massive size can make you feel safe even when sailing through a hurricane. But if a boat starts tilting, you start panicking, no matter how big it is. That was reportedly the case last Sunday evening when the Carnival Sunshine tilted dramatically just hours after setting out from Port Canaveral. "I didn't think anything of it, since it's not uncommon for ships to rock back and forth. But it didn't rock back. It kept leaning," a passenger told Orlando's News 6. "Plates and silverware started sliding off the tables. Then the tables themselves started to slide. Glasses and plates started to fall and shatter. At this point, it was pure chaos. Screams. Cries. Panic." The tilt, which is known as "listing," lasted "approximately one minute," according to Carnival, before the ship leveled off and continued on to the Dominican Republic. According to News 6, guests were seen carrying life jackets that night as a precaution. Eventually, the captain sent out a note to passengers apologizing and explaining what happened. In his note, the captain attributed the listing to the cruise ship's fin stabilizer and stressed that "fin stabilizers are not a safety feature; they are deployed solely for guest comfort to minimize any potential motion while at sea." All guests were given a $50 on-board credit. "There was never any issue with the safe operation of the ship and our officers quickly intervened to correct the situation," Carnival said in a statement to News 6. "Following the incident, evening events resumed for our guests. 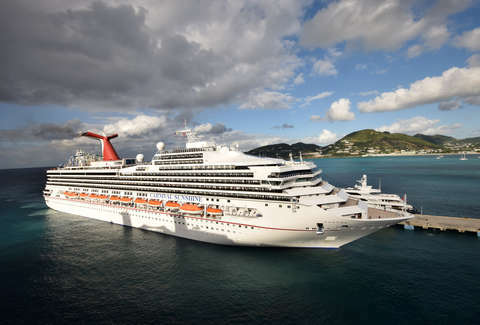 Carnival Sunshine proceeded on its Caribbean cruise as scheduled. We are very sorry for the disruption this caused. The ship remains fully operational and will sail as scheduled. We remain confident of the safety of the ship as we are committed to the safety of our guests and crew." Some guests reportedly flew home from a stop in the Dominican Republic on Tuesday rather than stay on for the remainder of the trip, which finished on Friday back at Port Canaveral.